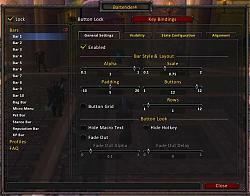 The latest version of Bartender (4.7.0) is fully compatible with WoW 7.0 and Legion! Q: How do i access the Configuration? A: You can open the configuration with the Slash Commands (/bt or /bartender) or through the Bartender4 LDB plugin. Q: Where are my keybindings? And how do i bind new keys? 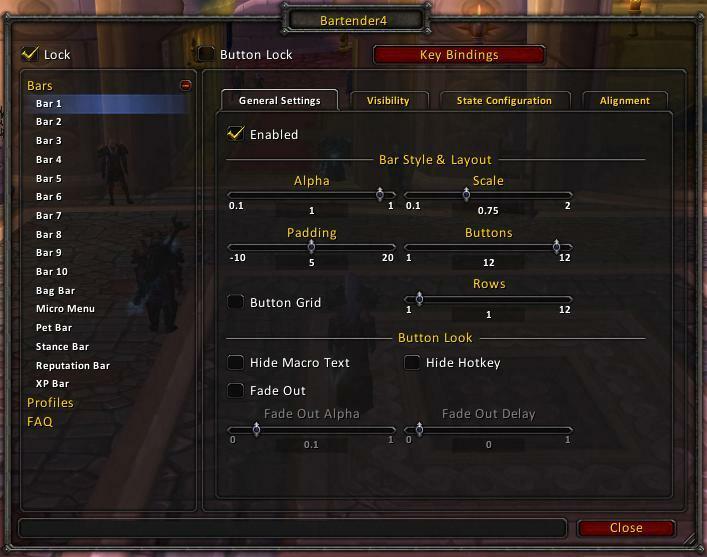 A: Bartender4 buttons do not automatically inherit keybindings from the Blizzard bars (except for Bar 1), you have to use the new KeyBound to re-bind your keys. You can access KeyBound by its slash command (/kb) or through the button in the BT4 config. Hover a button, press key → voila! Q: Can I skin the buttons beyond the built-in options? A: Bartender4 allows skinning through Masque! After installing both Bartender4 and Masque, you can customize the BT4 appearance in the Masque options. Q: How do i disable the snapping of the bars? A: Currently, you can temporarily override the snapping by holding down the Shift Key while moving your bars, or uncheck the option in the popup when your bars are unlocked. Please submit Bugs and/or Feature Requests using the Ticket System on the WoWAce Project page or in the Bartender4 Forum Thread. Please provide as many information as possible, including your client language, the exact version you are running, how to reproduce any errors, and a stack trace, if applicable. The mini-map button is missing, and the action bar buttons look quite different from how it's looked. Also, I can't seem to find the sticky bar checkbox. Why was the Roll Bar nuked? I loved that feature? Did something replicate its functionality. Where the stick cheak box! I loved the fubar plug,made things easyer to fix. I don't recall ever seeing a minimap button for Bartender4, just type /bar. Blizzard look with Bartender4's awesome features is gonna be sweeet. Last edited by karmamuscle : 10-15-08 at 04:15 AM. Whats this LDB thing that Bartender now plugs into? I've been running searches in various places, but coming up with nothing. Generally I would prefer to stick with the FuBar plugin, but I'm not averse to trying something else. Last edited by Fragglerock : 10-15-08 at 06:48 PM. If you are referring to the bars defaulting to "sticky" mode, then just hold shift while you are moving them, and they won't jump into place. nm. finally figured it out. Last edited by Vhaerun : 10-15-08 at 10:12 PM. I have a functionality question. I have seen on some other bar mods where when some DoT or action was cast on a mob or player, the button would stay highlighted until that action dissipated. For example, hunter's mark and serpent sting...when cast they would stay highlighted on the action bar then go to a normal state when they wore off. It made it easy to recognize so they could be re-cast. I really like this function and am curious if you can do this with Bartender or if it can be added into a future build. Anything like Buttonfacade? or does Buttonfacade work? Open the options and click on the Bag Bar. Then click on Key Ring checkbox. How do I get bar 7 to replace bar 1 when I go into stealth mode? On Bar 1 under the Visibility tab, I checked the box Stealth. Under the State Configuration tab I selected Page 1 as my default bar state and page 7 as my stance configuration for stealth state. However when I go into stealth bar 7 has not shown up. When I leave stealth, bar 7 appears for a moment and then bar 1 appears. It does that by default, from what I can tell. Try resetting your settings. So there is no plugin for Fubar yet? Is this going to be implemented? So 3.0 forced me to update from 3 to 4..alls well except for 1 cosmetic issue I don't much care for..
All my action bar buttons have a silver border..even when I lock bars & buttons.. I've never used ButtonFascade or whatever or anything to skin anything..I've just never encountered the silver border before & would like it gone..am I missing some toggle option within BT4?